eMi Project In A Former Soviet Republic. When dates for this project were initially confirmed, I was disappointed that we would miss seeing the students by one week. What’s designing a school when you don’t get to meet the kids? However, I was later told it was good we missed a busy graduation week and besides, once we met the administrators and teachers, most of whom had kids in the school, and some of the missionary parents, it was not hard to see the powerful impact a new, expanded MK school will make in Central Asia. Supporting Those Dedicated to Serve. 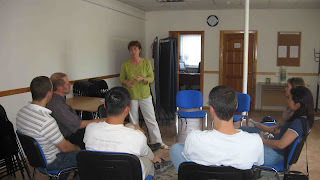 Missionaries in Central Asia typically take on many roles. One role, of course, is to live out their faith and spread the Good News of Jesus. Another is to hold a job which allows them to live in the country. To this end, some missionaries are in business, some are involved in high tech industries, while others are in teaching, counselling etc. In all, some 34 different ministries were currently represented in the student population of 250. We met one woman who is the director of a Christian counselling center. Two of her national staff told us their heart wrenching but inspirational stories of life in a country where abuse is common, corruption is rampant, family structures are breaking down and the easiest “out” in such desperation is the cheap alcohol found at every corner store. Of course many missionaries are parents of school aged children. In this region with dramatically low public education standards, unless MK parents are prepared or equipped to home-school, most rely heavily on the presence of a missionary kids (MK) school to ready their “third culture”* kids for life or school in their “home” country upon high school graduation. Charging fees about 1/5 of a comparable private international school the school we served provides an international level of education at a very reasonable cost. However, the need for educational spaces is exceeding available space and resources. It was this need, a simple note in my church bulletin last December that started a relationship between this school and eMi. 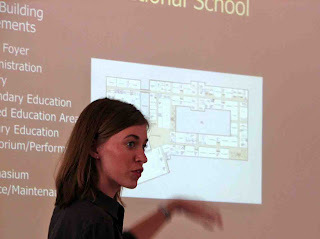 Design A 5,200 m2 (56,000 sf) K-12 School For 300 Students…In Six Days! Most of our team landed at 4 am on Sunday the 17th. We had all met, most for the first time, just hours before at Heathrow Airport in London. Two architects, a civil engineer, an electrical engineer and an architectural draftsman. Our Aussie surveyor had landed 30 hours previous and had already begun his land survey. Immediately, while still in a daze, we began our education about the country, the history of the school and the piece of land on which a new building would be built. It had been decided by a local Project Manager that it would be both difficult and costly to find local professionals who would master plan the new property and sit down to envision this school along with administrators and staff. However, he said that if a preliminary design could be done, it would be more manageable to find professionals to take over the design, to ensure adherence to local building codes, and to gain local permits and ultimately to construct the school. Our work included master planning the property, designing the school (expandable to 500 students), locating and sizing the water/waste water infrastructure, estimating power needs, and locating sports activity zones and areas for potential future development. Our objective was to provide a completed preliminary design with written reports over five days “in-country” and two weeks of post-trip work. During our work week in-country we walked the site, surveyed the property, interviewed numerous administrators and teachers and spent many hours working in a hot, muggy classroom in the old school. The school was a rabbit warren of small rooms, convoluted hallways and stairways with no two steps the same in height or depth: a remnant of Soviet era construction. This building has already been deemed unsafe to meet the demands of a 10.0 earthquake that could rock this region at any moment…and historically has. After numerous design variations and explorations, on Friday and Saturday we presented our completed work to local professionals, school administrators, teachers and parents. There was consensus that our design suited their needs. By Gods amazing grace, even under the stress and pressure of time and the massive scope of the project, our team, mostly strangers a week before, had become a cohesive unit. Now at home, we have two weeks to complete more drawings and produce a written Final Report which will document our investigations, what we designed and why we designed it that way. The first shovel is anticipated to hit soil in August. Children’s voices are expected to be heard in the new hallways in September, 2008. What a blessing to be part of such work with individuals who understand that submission to God’s call to use our skills in service, while praying for His grace and wisdom in the process, produces results that bless so many! What’s A Report Without More Photos? A new set of photos has been uploaded to my Photo Gallery for this project, so click here (Photo Gallery) and see the Central Asia set with a slideshow. If you want to read a description of each photo, you can also take a look at the photos in Details (Photo Details). Check it out and see what your support and encouragement has produced in the work of this team. Thank you for coming alongside me, my family and the work of eMi! PS. 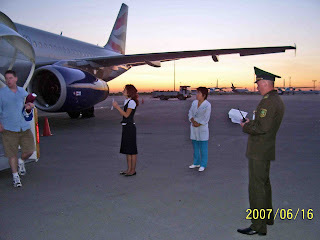 All specific place and photo references have been obscured to ensure safety for all of our contacts in Central Asia.